As part of the National Nest Box building week we are organising a morning at the hall on Sunday 2nd February, 10 am to 1 pm for children or adults who would like to build their own boxes. No charge but contributions welcome. Countryside Rangers (Geraldine and Pauline) will bring the boxes - pre-cut and drilled ready - and nails and tacks. We will also supply the tools (hammers are all that is needed). Any help from parents is welcome. The boxes will be yours to take away and put up in your own gardens. Please send me an email later in the Summer to let me know what birds you managed to attract or add your comments in the forum. If you are able to let me know (01403 266850) whether you are coming along it would be handy to know the numbers of nest box kits we need. 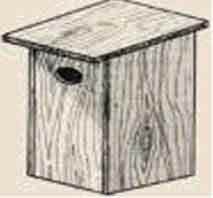 Local wildlife expert Colin Carver will also be there to help and answer and questions about best location for your box.